The Sterling Ropes Chain Reactor is available in two versions – standard and Guide edition. While similar in design to the Metolius Personal Anchor System, this unit is made exclusively from Nylon and contains no Dyneema or Spectra. This removes the concern created by the use of these materials in the personal Anchor System as this unit can be repeatedly shock loaded without compromising the material strength (although if it is, you might want to re-evaluate your Canyoneering methods). The standard version is exceedingly strong but the guide version “maxed out” the load test equipment at Sterling Rope without breaking. The down side of this product? The loops are a bit wider than the Personal anchor System thus adding a nominal amount of weight. It also seems to be a touch shorter than the Personal Anchor System. I use this device as an extension for my rappel device, a clip-in point for an ascender, as well as a clip-in point to the anchor to keep me safe while I rig my rappel device and perform my final safety checks. There are many uses for this and the list is only limited by your resourcefulness (and practicality). This piece of gear is a staple on my harness and I have used it for everything from casual rappelling to rescue situations where it was necessary to clip into the patients belay loop and cut the rope above her to get her free (not recommended without A LOT of training!). Although it is highly unlikelyto be an issue, in certain circumstances Dyneema or Spectra can lose most of their strength if it is shock loaded or severely stressed even one time. 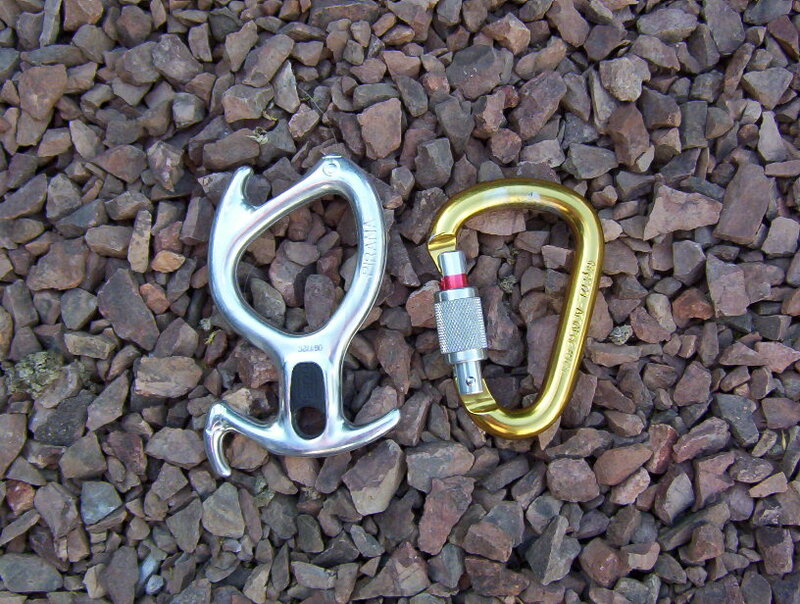 Canyoneers don’t generally place these kinds of loads on their equipment and even many rock climbers aren’t likely to shock these materials to this point. However in the interest of playing it safe, I would rather avoid these materials in my gear if at all possible. Since Nylon can be loaded and shocked repeatedly with little or no loss of strength, I have decided to replace my Metolius Personal Anchor System with the Sterling Ropes Chain Reactor. The Black Diamond ATC XP is a belay device based upon the trustworthy ATC with the notable exception of having additional friction ridges cast into one side of the device. These ridges offer more control over the person being belayed by allowing the belayer to lock own the rope with very little effort in the event the climber should fall. 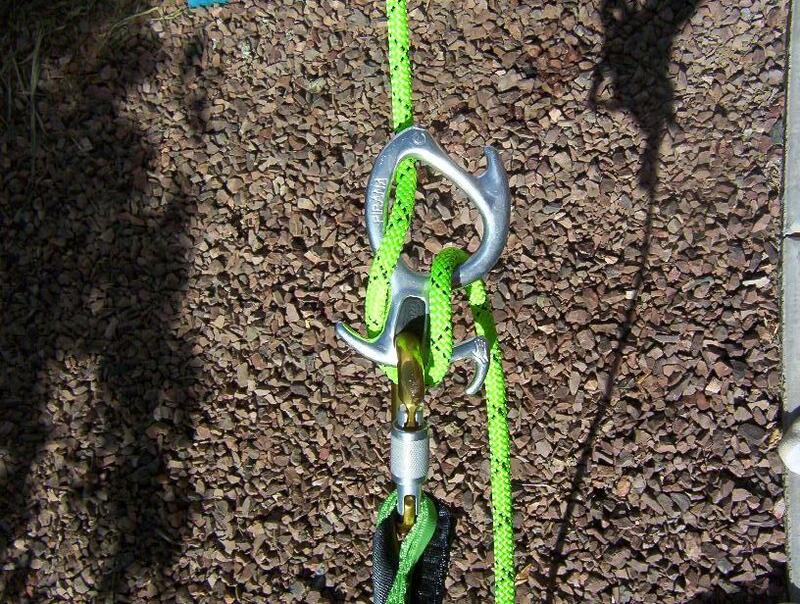 There are many rappel devices that look and function similar to the ATC XP and I don’t really know who pioneered this design but for the sake of keeping it practical (and simple), most of the belay/ rappel devices of this design will have similar characteristics. 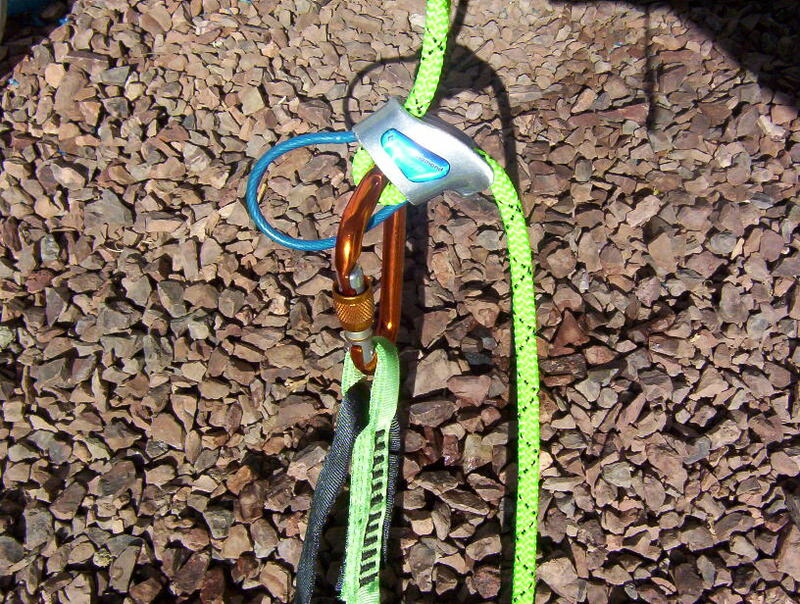 Since this is a Canyoneering post, we will look at the ATC XP as a rappel device. This unit has basically four modes of use: single line high friction, single line low friction, double line high friction, and double line low friction. In the high friction mode, the friction ridges will be on the tail side of the rope allowing the person on rappel to pull the rope into the ridges to control the descent as necessary. In the low friction mode (with the ridges facing away from the tail of the rope), it is much the same as a traditional ATC. Since the design of this product is based on rock climbing, use of any rope thicker than ten millimeter will result in a very slow – if not painfully slow – descent. For this reason, our evaluation will be done with Sterling Ropes HTP super static in 9mm. This is a polyester sheath/ polyester core dry treated rope that works well with Canyoneering. For the ease of photos, I have opted not to show it in double line configurations. In single strand high friction mode, this device is among the easiest to manage. The descent is extremely controllable and little strength is needed to stop. This is my preferred rappel device to use with new Canyoneers as it’s high friction and slow predictable descent characteristics can help calm quivering knees. 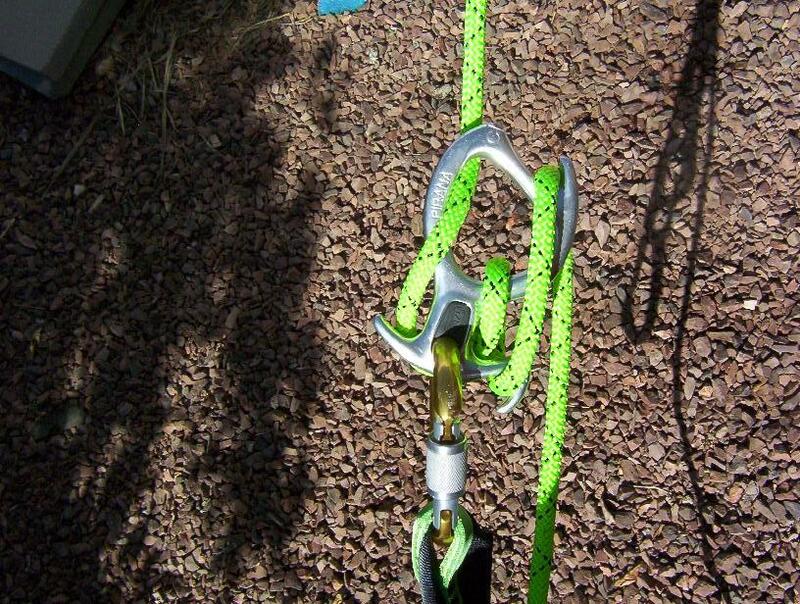 If you want to speed up your descent and add a bit of versatility, simply flip the device on the carabiner and feed the rope through In single strand low friction mode. The device becomes noticeably faster yet control seems to be a bit smoother (see summary). Canyoneers that anticipate being in a cold waterfall might appreciate this mode of operation as you can move a little more quickly when you need to maneuver behind or around rushing water quickly while still maintaining full control. Summary: Overall I really like this little device. It is an excellent choice for beginners as the high friction mode takes little strength to maintain total control of the rope. The only issue with this device is when using the high friction setting, it is sometimes hard to find the “sweet spot” when feeding the rope into the device. Because of the great grip on the rope, you have to give a little more slack than with other devices to get moving, then the device takes up the slack a little quicker than you might be feeding it and the rope sinks into the friction ridges again causing you to bounce slightly. This is more noticeable on ropes with higher static elongation properties (above 7%). The cable that comes molded with the device is a nice touch, however if you don’t pay attention to the ATC XP while you are coming off the rope, it is still easy to lose. Some canyoneers I know will tie a small section of thin cord to the cable of the ATC XP to make sure they don’t lose it. I generally don’t advise this as there is enough to keep track of near your rappel device and another cord is an un-necessary risk of tangling. Still, the control offered by this device has earned it a place on my harness as a competent rappel device and an excellent choice for novices as well. 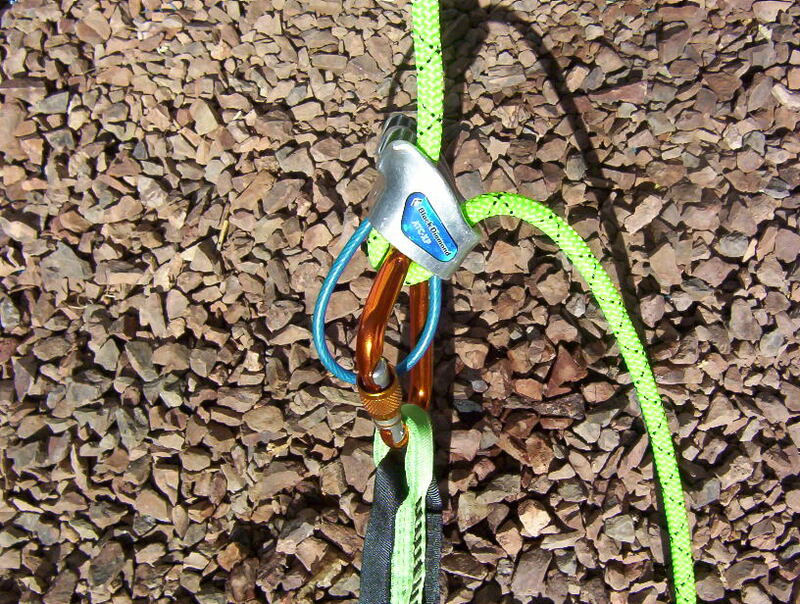 The Pirana is a rappel device manufactured by the Petzl corporation. It is a versatile unit with design options for no less than four different friction settings as demonstrated by the manufacturer. It is the incorporation of the necessary horns and rope channels into the design that give the Pirana its’ distinctly unique shape. It is a lightweight unit made from aluminum that retails at most places for around thirty five dollars. We had difficulty locating one at first but after a brief search managed to acquire one at a local Sport Chalet. Petzl recommends the use of this product on rope between eight and thirteen millimeter diameter. We tried it on various friction settings on eight, nine, and thirteen millimeter ropes in wet and dry rappels to evaluate the performance of this little device. The first thing noticed is an interesting little quirk about its preference for Petzl carabiners. It’s design features a plastic bushing that essentially traps the device on the ‘biner so it will not drop off when removing the rope from the device. This requires the carabiner to fit tightly into the device. 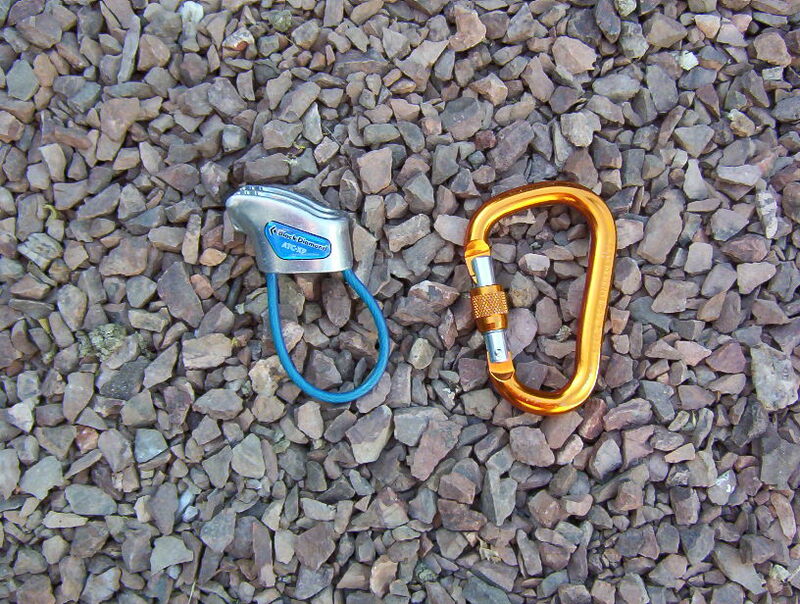 Petzl recommends the use of their Attache or William carabinerswith the Pirana and we would agree as these seem to be the only carabiners that fit the hole properly – if at all. Friction setting one is a fast setting with similar properties to a figure eight. 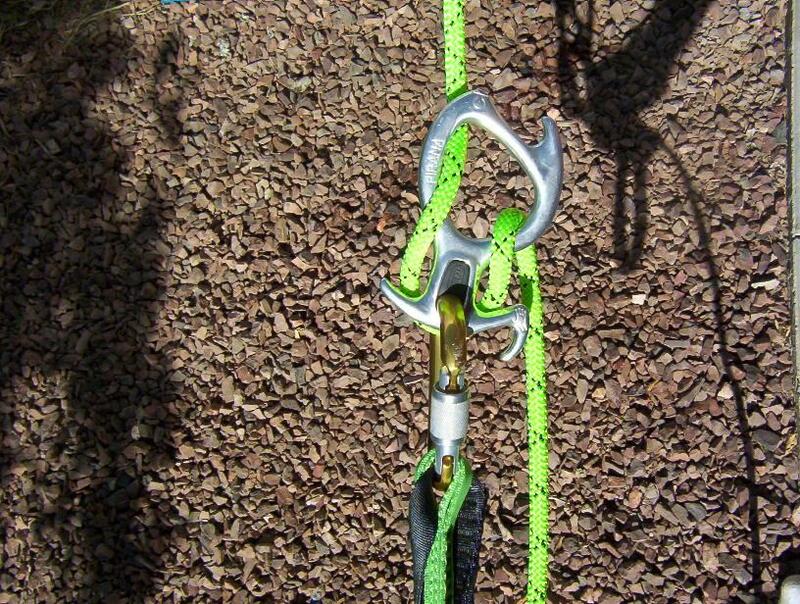 With our test rope this setting is best used on a moderate angle rappel (numerically less than 60 degrees) for the average user to easily maintain control. 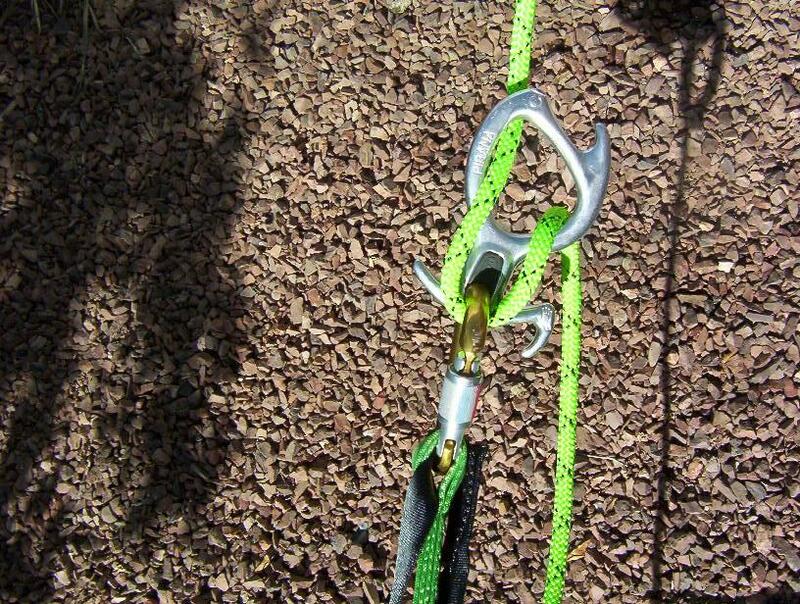 Friction setting places the rope behind the lower horn on the left side of the device (in the right handed rappel position). Friction setting two was much better and required a significantly lighter grip to keep your speed under control. It is still potentially a “fast” rappel but most can maintain control without too much effort at higher angles (60 to 80 degrees). long rappels or those that require tricky maneuvering might want to go to the next setting though. Setting number three on this device placed the rope behind both lower horns and was extremely controllable, offering smooth rope feed characteristics on high angle to free hanging situations. This setting is still manageable on lower angles but a little finesse is sometimes needed to keep the rope flowing smoothly under these conditions. Setting number four is the highest friction setting with the rope having to be basically fed through on all but free hang situations. This setting wraps the rope around both outer horns and is good in situations where you have a heavy pack or are rappelling through a waterfall and your footing is very uncertain. Be aware that under this setting you must keep light tension on the rope at all times in order to keep from allowing any slack in the rope from slipping off the upper horn of the device. This is extremely rare to the best of my knowledge I have only heard of it once and my source was prone to exaggerate) but it could be possible under some circumstances. The nice thing about friction setting four is it is applicable on the fly. You can be running any of the aforementioned three settings and apply number four on top of them at anytime during the rappel. This versatility is comforting if you find out mid-way through your rappel that you didn’t set up enough friction when you “got on the rope”. It is not difficult to do but practice this maneuver close to the ground first to get the hang of it before it counts. Summary: This little device proved to be versatile and sturdy as it would be expected to be from a company such as Petzl. Petzl products always come with detailed instructions and diagrams and the Pirana is no exception. The ease of use, versatility, as well as the light weight and design features definitely deserve our recommendation as a must – have rappel device. 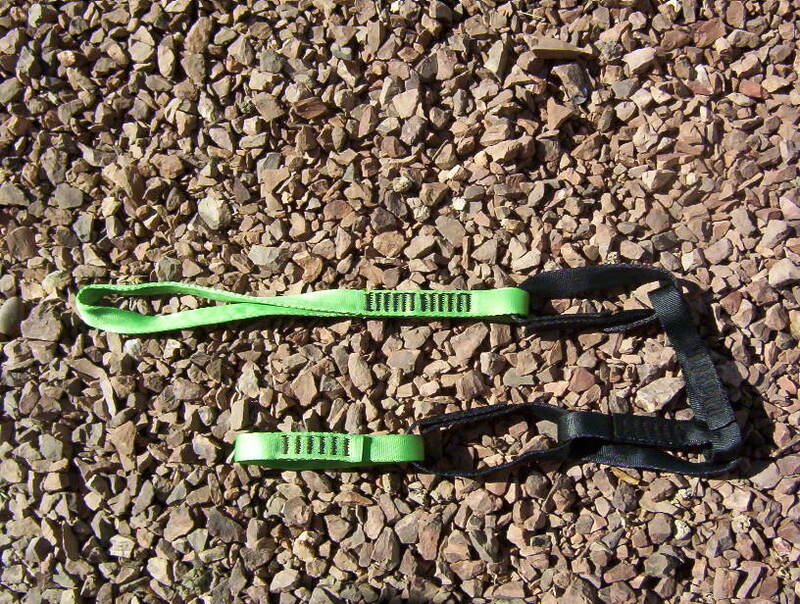 The tight fit onto the carabiner means you are less likely to lose it when coming of rope with wet, cold, stiff hands or when entering a pool of water. I have been using this little device for a number of years. I started this review long ago and just got around to finishing it. The information has been updated and the pictures are recent in the interest of keeping current. I have used the Pirana on ropes ranging from 8mm to 11mm, on polyester, nylon, and aramid. It has also been run in a double line configuration (not shown) and is now my preferred rappel device. SPOT Satellite Messenger – NOT P.L.B. Over the past year I have had some contact with a new satellite messenger called SPOT //www.findmespot.com). It is not a true PLB as I have found no information that would indicate it transmits on the analog SAR frequencies but it does have some very interesting characteristics that held my attention long enough to decide to try it. First a little back story. In November of 2007 I purchased a Terrafix 406 from ACR. This is a very high quality GPS integrated PLB (Personal Locator Beacon). One of the industries best. I paid nearly $700.00 for it (and it’s worth every penny). In January of 2008 SPOT came out with their satellite messenger (not an emergency PLB) for around $150.00. Wow that’s much easier on the budget – what’s the catch? There’s a yearly subscription that runs between $99.00 and $160.00 per year depending on which options you choose. Granted, that’s just over ten bucks a month, but it can sting a bit when you pay it in one lump sum. What you get for that subscription is a very interactive way to keep track of where you are. It offers you the ability to check in with people you have listed on your account, offers the ability to send a general request for help, as well as a 911 message to local authorities and SAR teams. The additional costs are for rescue insurance (about $8.00) that will cover up to $100,000.00 in rescue costs (that you hopefully never need) and a tracking option where it will send a blip about every ten minutes that is viewable on a web page provided by SPOT so others can track your progress. This is the other $50.00. I have had it about a year and I have been fairly impressed. It links directly with satellites – no cell service needed so it works even in the most remote back country or even on the water (it is waterproof to IPX 7 standards and even floats). I have had good communication for the most part. It does require a reasonable view of the sky (around 30 degrees) so if your GPS doesn’t get a signal, neither will SPOT. This is the main difference between this and a true PLB. A PLB signal goes out no matter what. As I live in AZ, I have yet to see how SPOT does under cloud cover. I guess I’ll have to wait for the next monsoon season… I have had less than spectacular results with this while Canyoneering, but in all fairness to the device, it was never really intended for this kind of environment. The only downside to this is I would not get satellite communication to signal for help should it be needed. However if I send my “I’m ok” message before I enter the canyon (which I always do), then those concerned can look at the website and see where this message was sent. This will give them a pretty good idea of where to start their search should I become over due. Those who would contact authorities would also know me well enough to tell them to find the deepest, darkest hole or crevice and start looking there. The interactivity of Spot is what I like the best. On my ACR unit, I won’t ever pull it out unless I need it. And then it’s only when the situation is truly dire. SPOT lets me tell people when I get to my destination, track where I am, and even to ask for assistance if I need to without a full scale rescue. There have been many rescues credited with this device but it’s no substitute for a knowledgeable companion, proper preparation, and letting someone know where you’re going and how long you intend to be gone. If you feel you will be placing yourself in truly risky circumstances where an accident would leave you in a place where you’re not likely to be found until rising water levels from Global Warming float your bones and backpack to the nearest beach, you may want to consider purchasing or renting a bonified PLB. The only other draw back to this unit is it requires Lithium Ion batteries only. If you are using the tracking feature, you can expect them to last about 24 total hours. If you just use it to send your “I’m ok” message and continue keep it on to send the possible emergency message should it be needed, they will last a bit longer (I don’t know how long exactly as I don’t ever use mine this way). lithium batteries are fairly pricy considering I go through them at a rate of a set of them over the course of two long days of canyoneering or hiking. Fortunately it only takes two. The other drawback is trying to switch from the “I’m ok” message transmission to the tracking transmission. You have to wait for it to either complete the twenty minute cycle needed to ensure the “I’m ok” transmission went through or you can wait five minutes after activating the “I’m ok” message, turn it off, then turn it back on and enable the tracking feature. I would like to see this remedied on future units but all in all it is a great product at a reasonable price. This pretty much sums it up. For more clarification on the unit, it’s features, and subscription options, visit the SPOT website posted at the beginning of this article.